Below is a project I completed for a course called Statistical Foundations of Data Visualization at NYU. Scroll down to read my full analysis. Note: all means referred to are linear modeled means. Does an increase in health spending result in a lower death rate? For this project, I compared worldwide death rates with health expenditure to see if I could find the answer. The data comes from the World Bank World Development Indicators Database. Death rate data is available from 1960 through 2012, however, health expenditure information is only available for 1995 to 2012, so we’ll be looking at the latter range. The death rate is the number of deaths occurring during the year per 1,000 people, estimated at midyear. Total health expenditure is the sum of public and private health spending as a ratio of total population in current US dollars. Public health expenditure consists of spending from government budgets, external borrowings and grants (including donations from international agencies and nongovernmental organizations), and social health insurance funds. Private health expenditure includes household out-of-pocket spending, private insurance, charitable donations, and direct service payments by private corporations. Linear regression creates the best fitting straight lines for each of the datasets, giving a clear indication of whether a country’s death rate and health spending are increasing or decreasing over this period, and at what rate. I’ve highlighted a few countries of interest. The mean death rate declined slightly over this period, from about 10 deaths to between 8 and 9 deaths per 1,000 people. Most countries are close to this mean with death rates from about 5 to 12 deaths per 1,000 people. Countries with lower death rates are holding steady or decreasing just slightly, while countries with higher death rates are less consistent, with some increasing and others decreasing. Health expenditure is quite different, with nearly every country increasing health spending over this time period, some showing a very steep increase. Worldwide, mean health spending has increased from about $100 per capita in 1995 to about $1000 per capita in 2012. The United States and Norway outspent all other countries, each with around $9,000 per capita expenditure in 2012. The countries highlighted are not random choices. 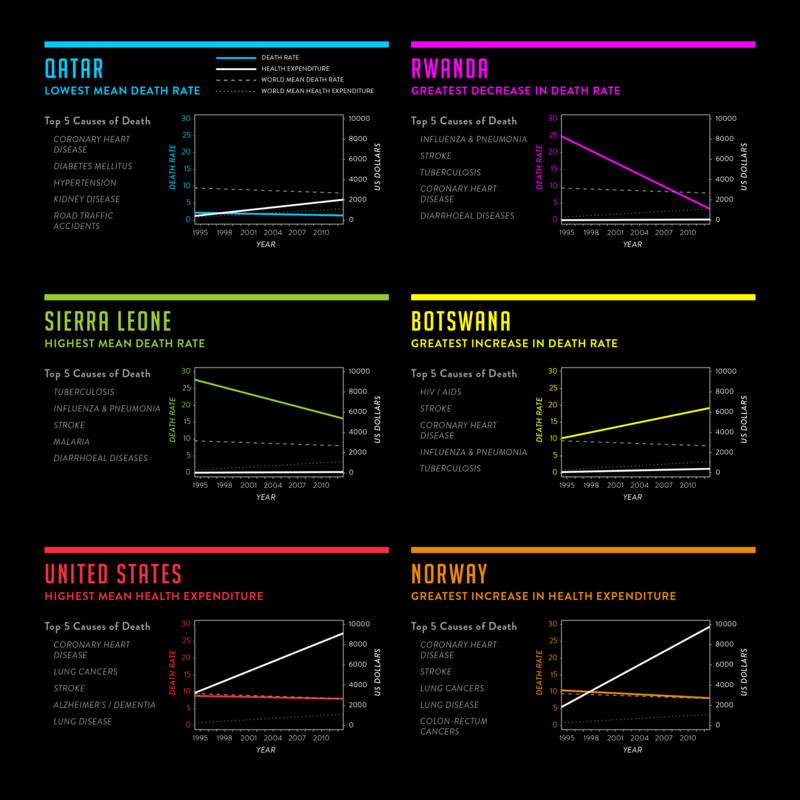 These six countries are those with the greatest increase or decrease in death rate (Botswana and Rwanda respectively), the highest or lowest mean death rate (Sierra Leone and Qatar), the greatest increase in health expenditure (Norway), and the highest mean health expenditure (The United States). According to a study published by The World Health Organization, nearly all of these countries have a high incidence of death due to coronary heart disease and stroke. Rwanda, Sierra Leone and Botswana – with overall high death rates and low health spending – have high incidence of death caused by infectious diseases such as tuberculosis, influenza and pneumonia. For Qatar, The United States and Norway – with overall lower death rates and higher health spending – the top causes of death include what are often called “lifestyle diseases,” such as lung cancers and lung disease, diabetes mellitus (type 2 diabetes), and hypertension. When comparing death rate and health expenditure by country on a double y-axis, The United States and Norway, with high spending and average death rates, are nearly the opposite of Sierra Leone and Botswana, with very low spending and high death rates. However, we cannot conclude just yet that higher health spending will result in a lower death rate. In a direct comparison of the two datasets, most countries saw very little change in death rate. 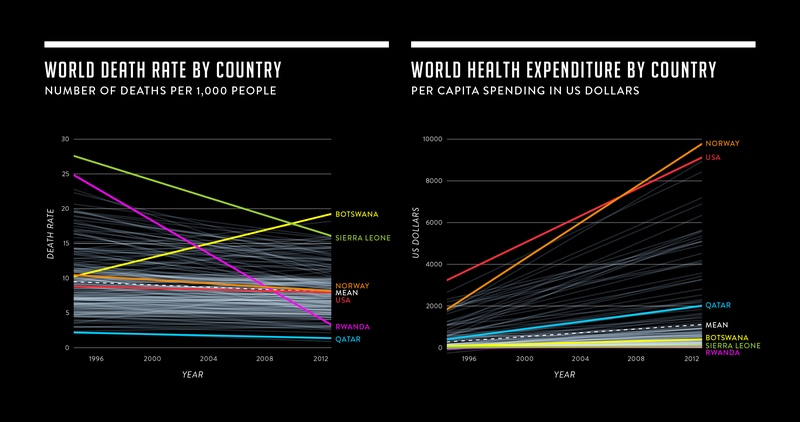 Countries that saw a decrease in death rate did so with little or no increase of spending. 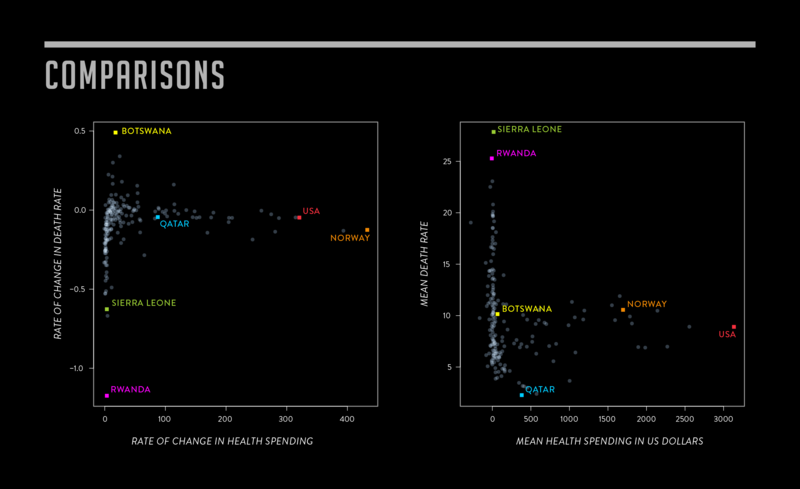 In particular, both Rwanda and Sierra Leone show decreased death rates with no increase in spending. This makes sense, since both of these countries experienced violent conflicts during the 1990s which are no longer active. It’s understandable that deaths due to war and violence may affect a country’s death rate but not be affected by a change in health spending, and that the end of these conflicts resulted in a reduction in death rate. Norway has increased it’s spending the most of any country but has seen a decrease in death rate only slightly greater than The United States. Both countries are spending a lot more and only achieving a very minor decrease in death rate. Comparing the mean death rate to the mean health spending, most countries spend very little on health, yet these countries have a wide range of death rates. Sierra Leone and Rwanda have the highest mean death rates over this period, with over 25 deaths per 1,000 people. Once again, this is probably due to the violent conflicts taking place in these countries during the 1990s. The United States spent much more than other countries while having a death rate very close to the overall mean, just under 10 deaths per 1,000 people. Many other countries achieve a similar rate while spending very little. It makes you wonder if the US is getting very much for all that spending. Qatar, with the lowest mean death rate, spends a bit more than most countries, but not nearly as much as The United States, Norway and a handful of others. According to this data, spending the most on health does not produce the lowest death rate. In addition, spending very little on health can have a wide range of results.